TL;DR: How to put MongoDB statistics up in lights for ambient status displays. In the previous MongoHQ Tinkertank article, we showed how to use Node.js, Mongo, Express and the Smoothie graphing library to create charts based on sampling the MongoDB oplog. This combination was put together in support of another project though, a plan to create physical statistics displays. To prove the concept we reached for an Arduino Uno board and one of Adafruit's NeoPixel shields. The shield clips to the top of the Arduino and lets the programmer drive 40 RGB LEDs, called NeoPixels by Adafruit, arranged in an eight by five grid. This will be enough for us to display three bar indicators of the statistics we harvested in the last article. The Adafruit Neopixel shield in a moment of unblinkingness. You will want to have the Arduino IDE already set up as we will have a program to load onto the device. Consult the Arduino Getting Started pages for instructions on how to configure it for your desktop platform. Assembling the hardware is simply plugging the NeoMatrix shield into the Arduino and connecting the Arduino to your system using an appropriate USB cable. We'll get back to programming the Arduino in a moment, but first we want to modify the Node.js software to drive our hardware. To connect our system we'll be using a serial connection over that USB connection and usefully, there's already a serial port package for Node.js called SerialPort. This lets us asynchronously handle the serial port. For this use, we'll just be writing to it but it is easy to imagine reading from the port to get information from sensors attached to the Arduino like light levels or temperature as part of an Internet of Things. Taking the lights-web.js application from the previous article, we will now perform some simple modifications. And that should be all the changes done. If you run this now, it'll crash as there's nothing listening on the serial port. Let's get the Arduino code up and running. For this code we've used the Adafruit NeoPixel, NeoMatrix and GFX libraries and they need to be installed in the IDE before you can progress. There's an UberGuide at Adafruit on how to drive the various RGB LED displays that are available. Many of them are strips of LEDs, so the NeoPixel library has an API which addresses them as a single row. The NeoMatrix library then does the mapping work needed to address them as an n-by-n array and the GFX library builds on top of that for graphics primitives. 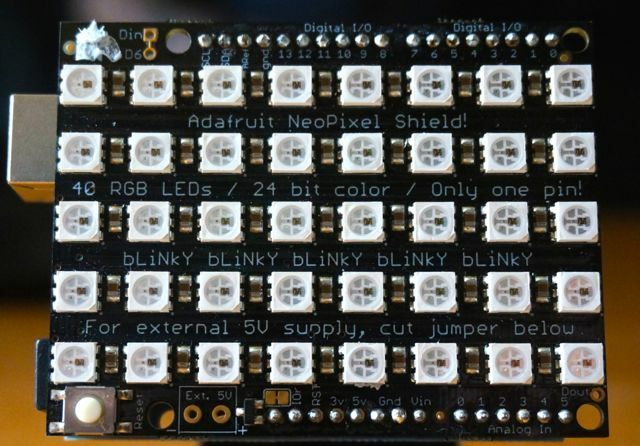 There are instructions for installing NeoPixel, NeoMatrix and GFX libraries in the Adafruit guide. If you have time, read the rest of the guide as it will describe how the RGB LEDs work and how strips and arrays of them can be wired to work together for even bigger displays. The three arrays are going to be used to keep recent values which will be used to 'scale' our charts. The newdata flag will signal when we need to redraw later. In Arduino programming the setup() function is always called first. Here, we intialize the matrix and set its brightness to 64, a quarter of its maximum because these LEDs are bright and we assume you like your retinas. We also initialise the serial port to operate at 9600 baud, matching what we set in the Node.js code. Arduino programs spend their run time forever tearing around a loop() function, which is the next thing we'll define. If there is some serial communications, we try to read three integers from it. If that succeeds we then look for the end of line and if we get that we do some processing, rotating the arrays we defined earlier, inserting our new values and setting the newdata flag so it'll redraw everything next time round. The first thing the drawing function does is clear the virtual screen we are drawing on. Then we run through the recent values we have received over the serial port and find the highest, then round it up to the nearest 10. We'll use this value to scale the bars. Next we draw our three bars, using the most recent value for insert,update or delete and our scale factor. The three other values denote red, green and blue. This is a simple visualisation – partly to make it easy to understand and partly to keep the cost down – but there's so much more to explore. With appropriate power supplies to the LEDs, you could chain numerous strips together to give you an ambient status display in your office. You could attach a screen shield to the Arduino instead to give an LCD panel with graphs and detailed status content. You could break the USB chain between the Arduino and the Node.js system with a low-cost wireless connection allowing you to site the device anywhere you can get power to it - or make it battery powered (though batteries do get consumed quickly with lit LEDs). With wireless though you could strip down to a simple OLED display and beeper and create a MongoDB aware office pager. And you could even lose the PC or Mac from the equation and gather your MongoDB data on a Raspberry Pi or BeagleBone Black which will happily run Node.js. All you need is some imagination and a MongoDB configuration which gives you oplog access... like MongoHQ's Elastic Deployments.